every once in a while when we were little my mom would have orange night. a dinner with all orange foods. 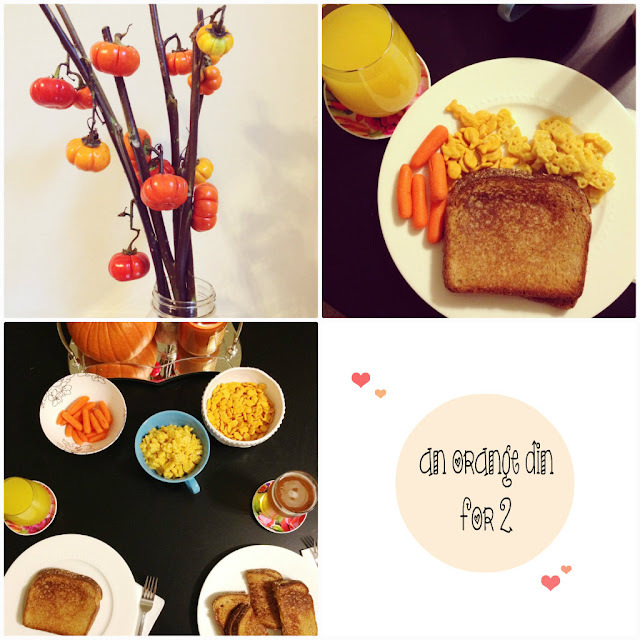 so just like last fall, we had our orange din for two one night last week. grilled cheese, carrots, mac & cheese, and goldfish. and while i do realize its a meal for the littlest of children, i still really love it. and you know what, i think austin does too! I love this idea! And let's be honest, sometimes the simplicity of Goldfish are so much more appealing than cooking some extravagant side dish. Totally stealing this tradition :) Happy Monday! This is such a fun idea, and I'm all about some traditions! how sweet is this!!! Love that it doesn't even have to mesh together... as long as it be orange!! !